Zhongrong Xinda (Qingdao) Mineral Resources Co., Ltd. was established in 2016. The company has acquired 39 mineral rights in the Banggou gold-copper-cobalt-iron-polymetallic mine in Per through M&A merger and acquisition, covering the area of 263 square kilometers. 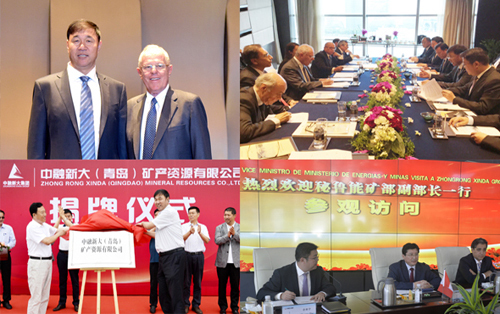 According to the verification of Shandong Zhengyuan Geological Prospecting Institute on resources reserves, the six mineral rights of the Bangonggou Cu-Co-Fe polymetallic deposit in Peru have been basically proved that based on the controlled resources, these six mines belong to the worldwide super-large skarn deposit, and also the world's largest gold, copper, iron and polymetallic deposits of single-body skarn type. At the same time, the deposits contain gold, copper, cobalt and other ore body with prospective reserves of 10 billion tons of iron, 11 million tons of copper, 850 tons of gold, 87,000 tons of silver, 3.13 million tons of cobalt. In addition they have been found with molybdenum, rhenium and other available rare elements with high economic value. In order to run mines successfully in development and operation, on July 30, Zhongrong Xinda (Qingdao) Mineral Resources Co., Ltd. signed a strategic cooperation agreement with Shandong Zhengyuan Mining Co., Ltd. to fully promote the development and construction of Bangguo Cu-Co-Fe Polymetallic Mine project and to achieve low-cost expansion of mineral resources plate, which will lay foundation for the company's transformation and upgrading, and its overseas industrial layout. During the 13th Five-Year Plan period, the Mineral Resources Section will be led by the development of the Banggou gold-copper-cobalt-iron-polymetallic mine in Peru. And it will take advantages of the port and reserve land to make efforts to build a complete industrial chain including the exploration, mining and dressing, processing, logistics, trade and others for non-ferrous metal ores and precious metal ores. It is expected to be the new industry support for Zhongrong Xinda Group. By the end of "thirteen five", the mineral resources sector is expected to achieve total assets of 120 billion yuan, sales income of 36 billion yuan, profits of 6 billion yuan. On September 15, 2016, Peruvian President Vladimir Kurczynski was invited to visit China and met with Group Chairman Wang Qingtao in Shanghai. The president then listened to the development plan of the Banggou gold-copper-cobalt iron polymetallic mine in Peru and instructed the first Vice President of Peru and Minister of Transport and Communications Biskala to contact with the Group leaders for co-operation. With the support of relevant government departments in China and Peru, the Banggou project is expected to become a national key project between the two countries and will also become a powerful engine for the expansion of assets and the increase of profits of the Group.